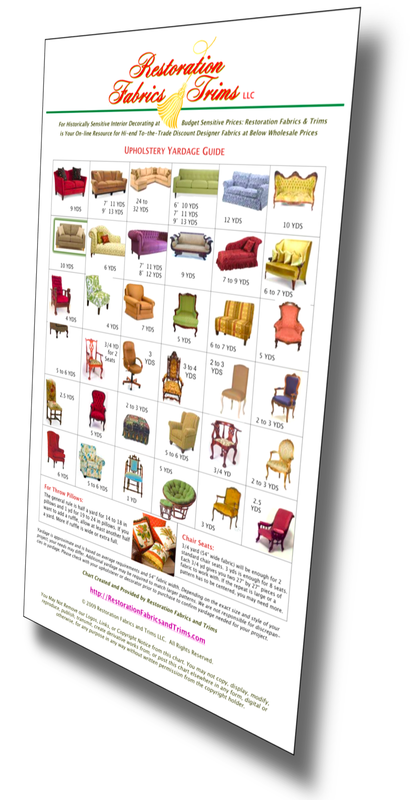 Our easy-to-use Illustrated Upholstery and Bedding & Table Linens Yardage Charts are handy for estimating how much fabric you will need for almost any decorating project. Transform a bedroom or re-cover any piece of furniture. 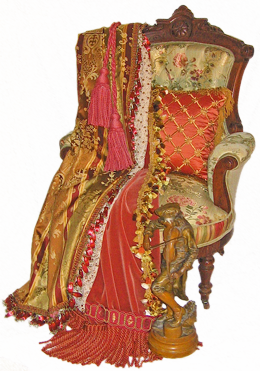 Whether you are upholstering a New, Vintage, or Antique Chair, Loveseat, Sofa, or Ottoman, a Chaise, Couch, Sofa or Settee, we've got it covered! The bedding chart includes sizes from twin through king. Yardage estimates are given for bedskirts, shams, duvets or comforter covers. Below that you'll find fabric and trim requirements for table lines from napkins to round tablecloths of various diameters. Whether you are doing one piece or a houseful, our complimentary illustrated charts make it easy to estimate how much fabric you will need for any project. Click on the photos to download a PDF file of the corresponding chart.